A CONSIDERABLE avalanche danger remains at the mid-elevations on all aspects for glide avalanches in the Turnagain Pass, Girdwood Valley, Summit Lake and surrounding mountains. Glide cracks continue to release and produce large and destructive slides. Avoiding time under glide cracks is recommended. At the upper elevations (above 3,000') there is a MODERATE avalanche danger where shallow wind slabs 6-8" thick may be found and possible to trigger. Watch for, and limit time under, cornices which are large and looming along ridgelines. Last, the sun may warm the surface enough for human triggered wet loose avalanches on southerly aspects. *If you are headed to the Summit Lake area don't forget to check this morning's Summit Lake Summary. The snowpack continues to fall apart at the ground. 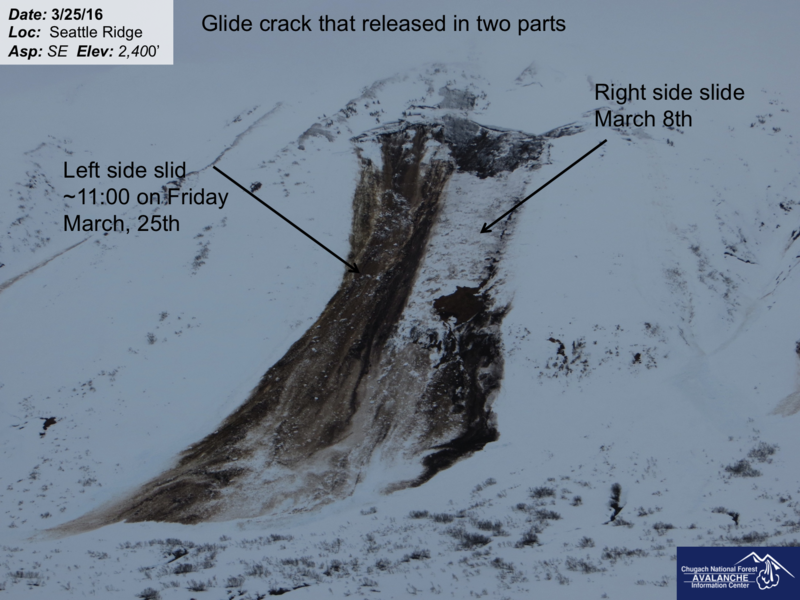 Yesterday, another large glide crack released on the face of Seattle Ridge. If you are headed to Turnagain Pass this weekend you can't miss it, it's front and center, just across from the motorized parking lot. If you have not been to the 'Pass' for a while, you may be surprised at how many cracks litter the mid-elevations and how many of these have released. It goes without saying, staying out from under glide cracks is HIGHLY recommended! *With the unseasonably warm temperatures over the past week, the springtime melt-down (or shed-cycle) is closing in upon us. We do have cooler temperatures for today, and likely tonight, that will form surface crusts as high as 2,500', but it is good to remember that undreneath the pack is very wet and unsupportable at these mid-elevations. This 'rotten' soft snow, so to speak, is a red flag for not only the glide problem but for the potential for large wet slab and wet loose avalanches. Wet Loose Slides today? Southerly slopes seing direct sunlight may warm enough to melt the surface crust. In this case, wet loose slides could be triggered by people. Keep tabs on the surface conditions. At elevations above 3,000' (above the majority of the glide crack/avalanche hazard) fairly dry snow exists. There was roughly 2-5" of new snow yesterday which sits on a mixture of old loose snow and old sun and wind crusts. Shallow wind slabs composed of mostly the new snow likely formed on leeward slopes during yesterday's moderate Easterly winds. These slabs should be ~6-8" thick and in pockets along ridgelines. Quick hand pits and watching the surface texture for smooth rounded wind pillows and drifts will help to find any relatively new wind slabs. With a chance for direct sunshine today (and tomorrow) watch for cornices to weaken and possibly fall naturally. We have not seen much cornice failure recently but we do know these large features will begin to start calving soon. Limiting and avoiding time under cornices will be key as we head into springtime hazards. If skies clear for travel above treeline, take stock of the slope or couloir you wish to ride/ski - is there a large cornice looming over you while you ascend/descend? Yesterday's weather consisted of overcast skies with some light precipitation in the morning hours. Around .5" of rain fell up to 2,000' and between 2-5" of snow fell above 2,000'. Ridgetop winds were moderate, averaging to 20mph with gusts to 40mph from a generally East direction. Temperatures were in the mid-30's at 1,000' and upper 20's at 3,000'. Overnight, winds have died down substantially and temperatures have cooled off several degrees and move into a break between storms. For today, we are expecting partly cloudy skies, which could become quite clear by noon before a chance more clouds might move in later today (tough sky cover forecast). No precipitation is expected and winds are slated to be light to moderate from a Northerly direction, averaging 5-15mph. Temperatures should begin to climb again today as the sun comes out and reach up to 40F at 1,000'. Sunday looks to be nice: mostly clear skies and light Northerly winds as a quick high pressure ridge builds before another low pressure system moves in Sunday night.